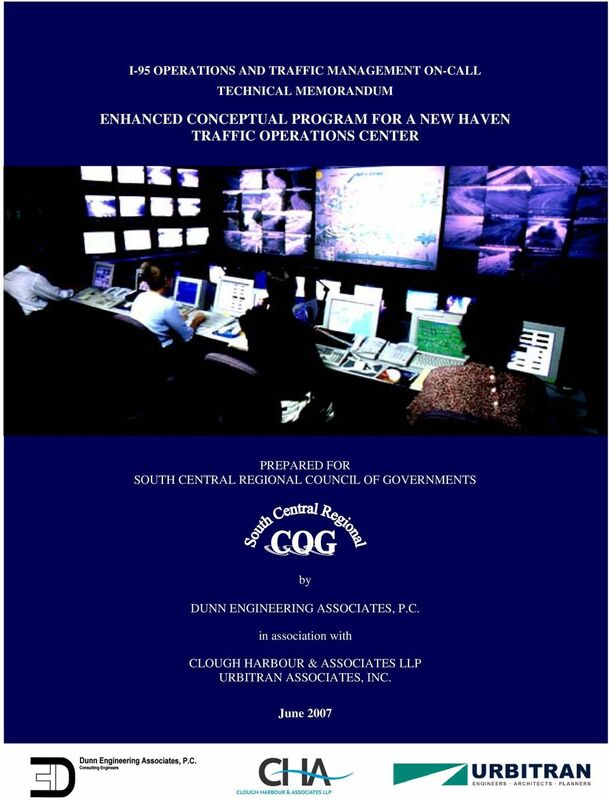 Download "ENHANCED CONCEPTUAL PROGRAM FOR A NEW HAVEN TRAFFIC OPERATIONS CENTER"
2 EXECUTIVE SUMMARY A Traffic Operations Center (TOC) to be operated by the New Haven Department of Traffic and Parking is recommended to facilitate corridor operations in the New Haven area. 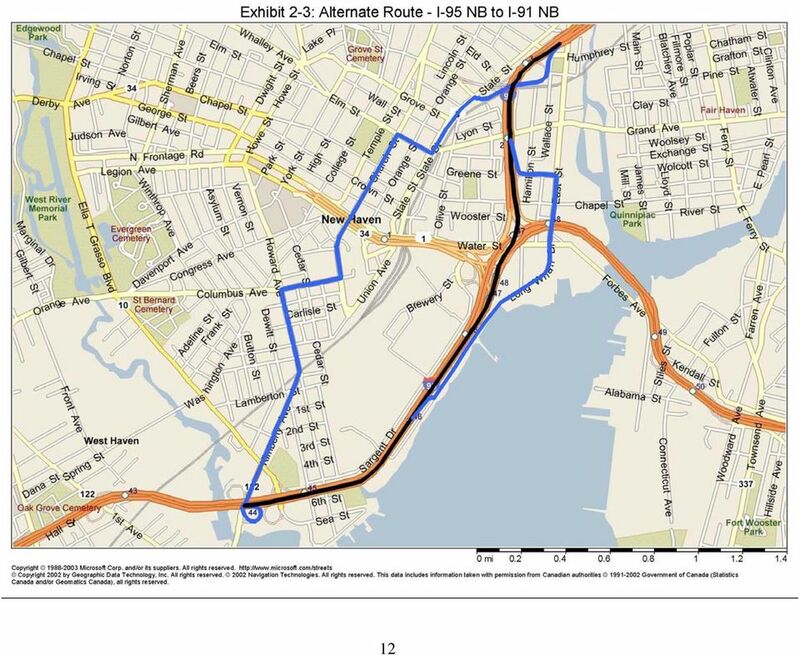 While management of traffic in connection with the Harbor Crossing Corridor Improvement Program is an initial function, the TOC will serve to manage operations after construction is complete. 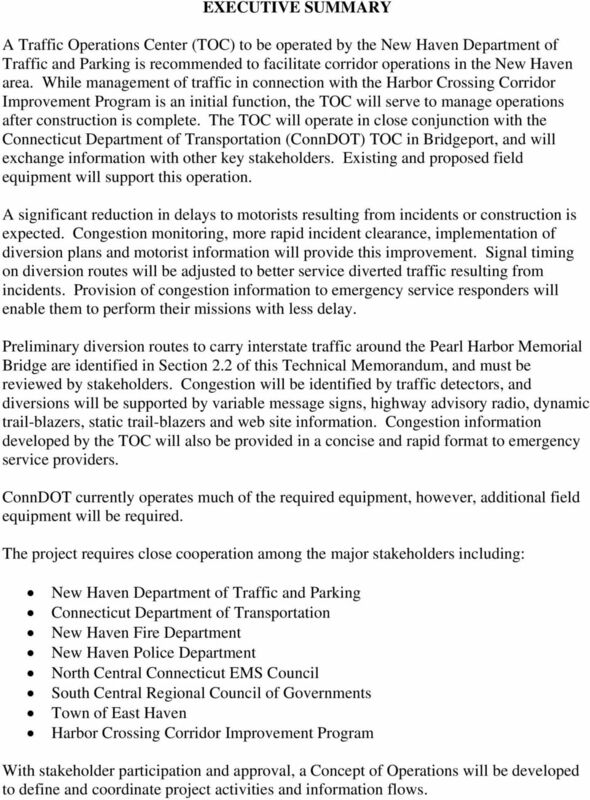 The TOC will operate in close conjunction with the Connecticut Department of Transportation (ConnDOT) TOC in Bridgeport, and will exchange information with other key stakeholders. 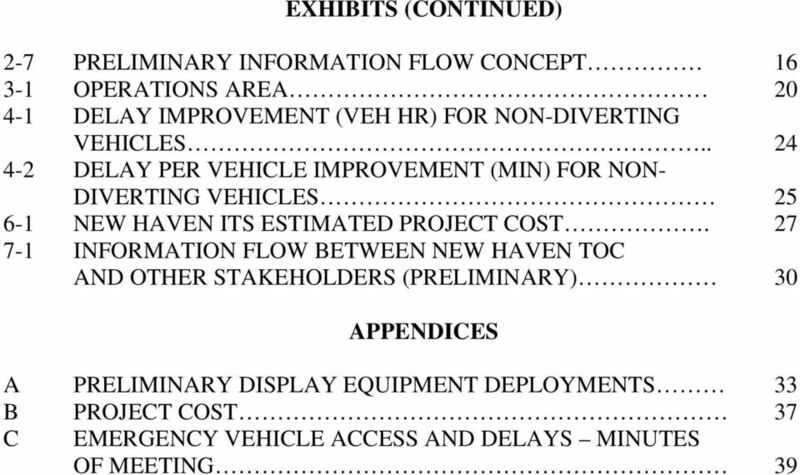 Existing and proposed field equipment will support this operation. 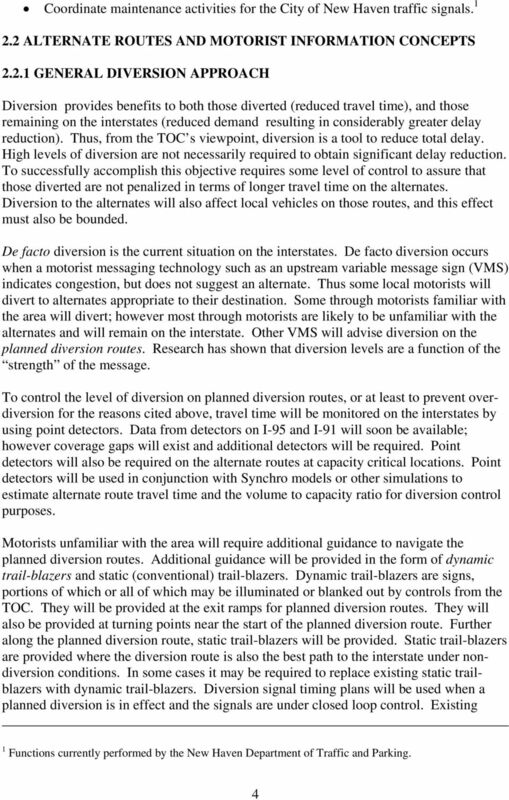 A significant reduction in delays to motorists resulting from incidents or construction is expected. 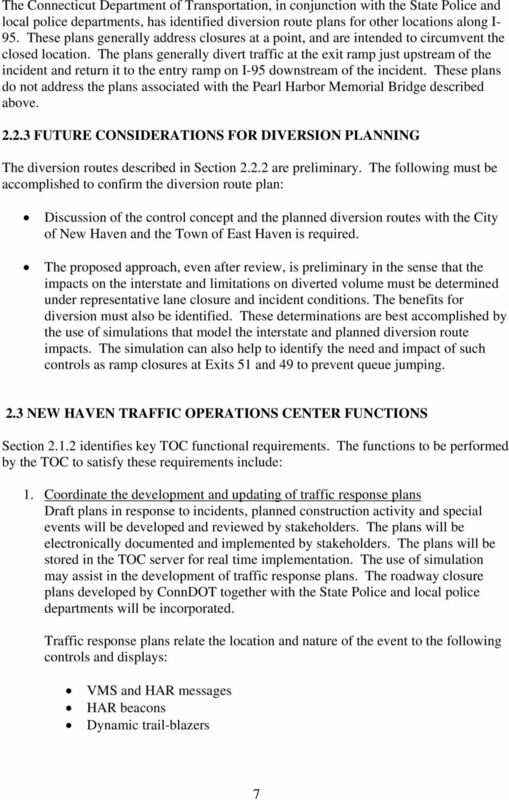 Congestion monitoring, more rapid incident clearance, implementation of diversion plans and motorist information will provide this improvement. 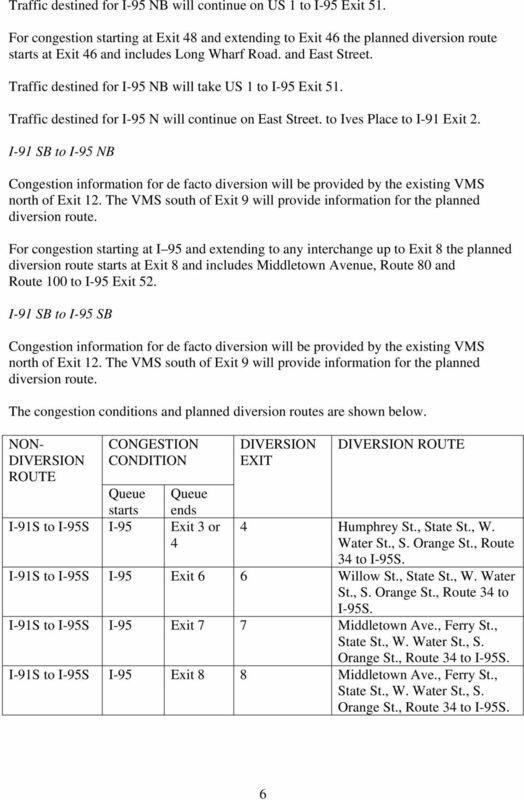 Signal timing on diversion routes will be adjusted to better service diverted traffic resulting from incidents. 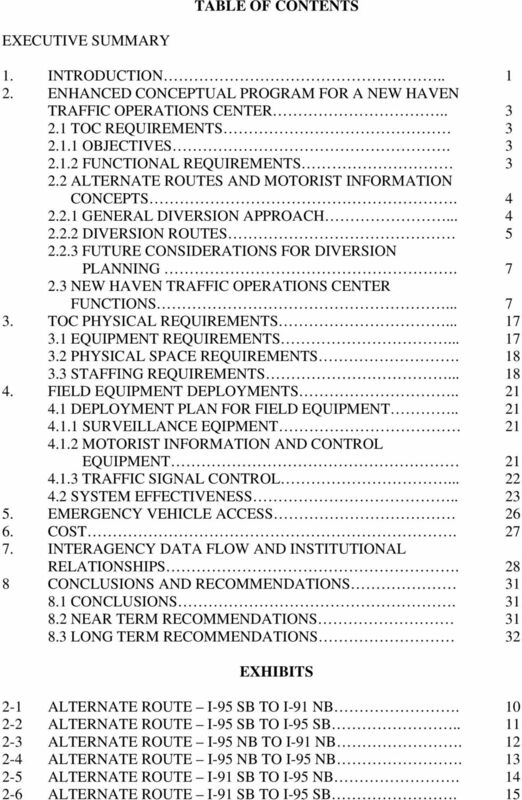 Provision of congestion information to emergency service responders will enable them to perform their missions with less delay. 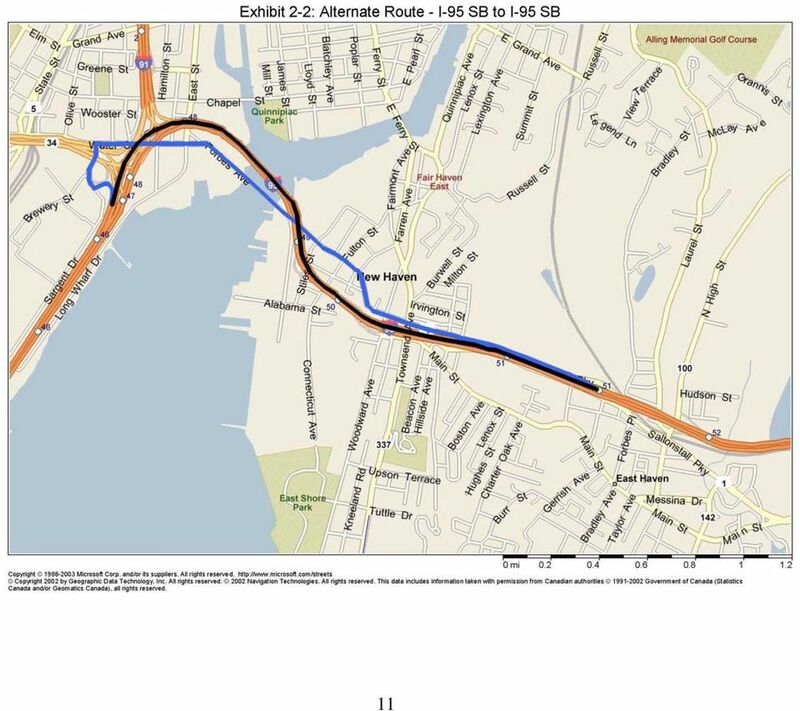 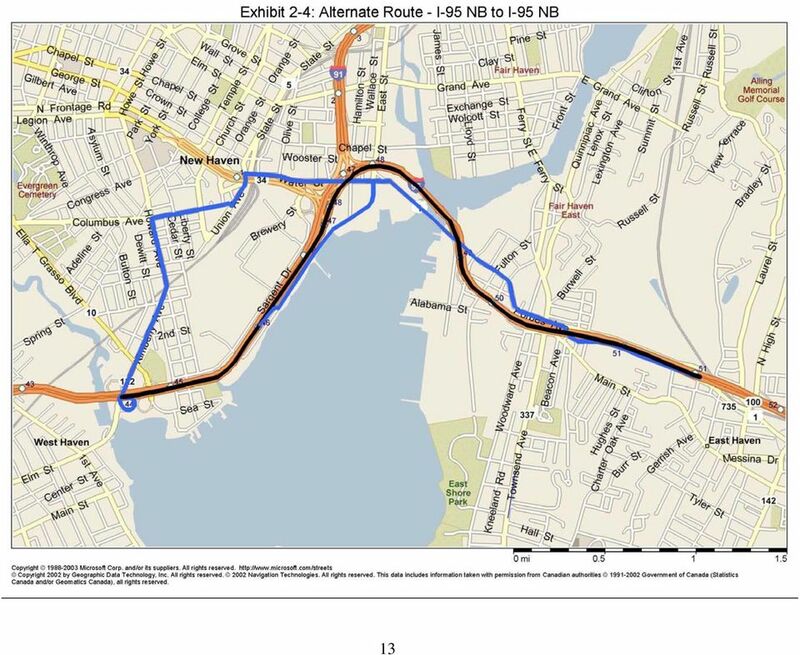 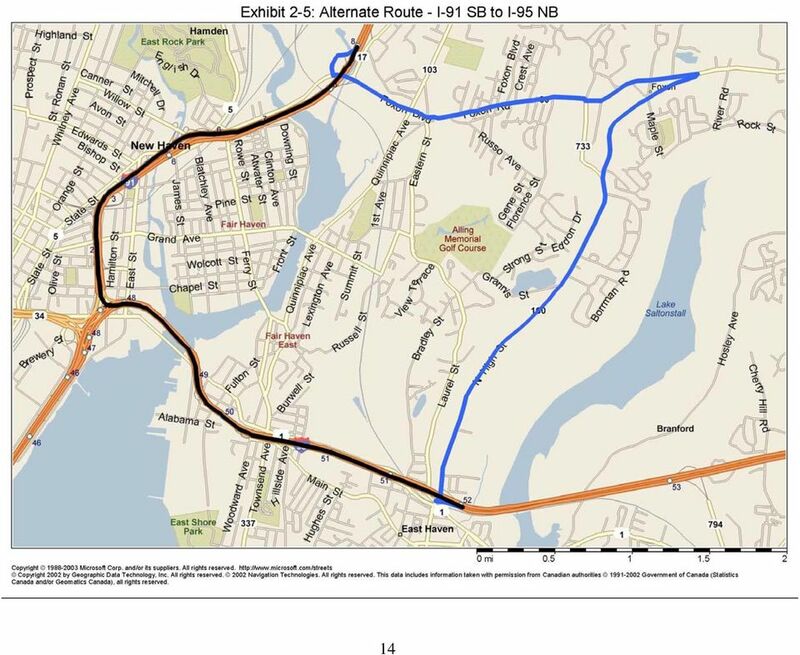 Preliminary diversion routes to carry interstate traffic around the Pearl Harbor Memorial Bridge are identified in Section 2.2 of this Technical Memorandum, and must be reviewed by stakeholders. 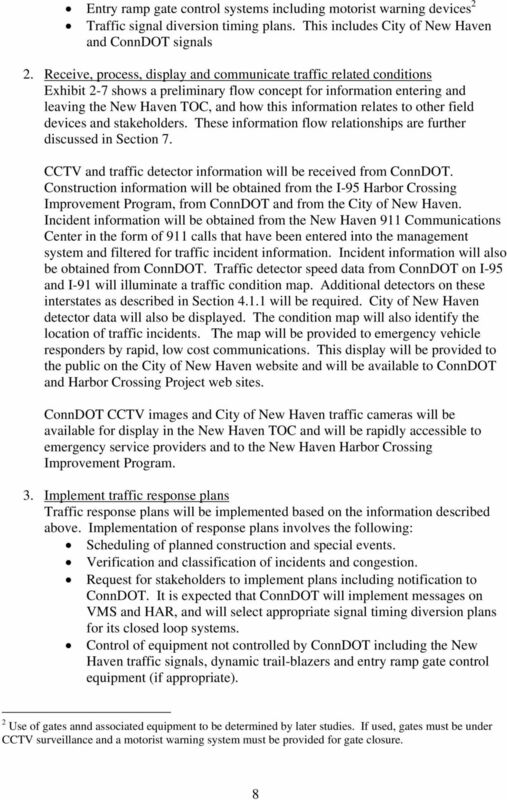 Congestion will be identified by traffic detectors, and diversions will be supported by variable message signs, highway advisory radio, dynamic trail-blazers, static trail-blazers and web site information. 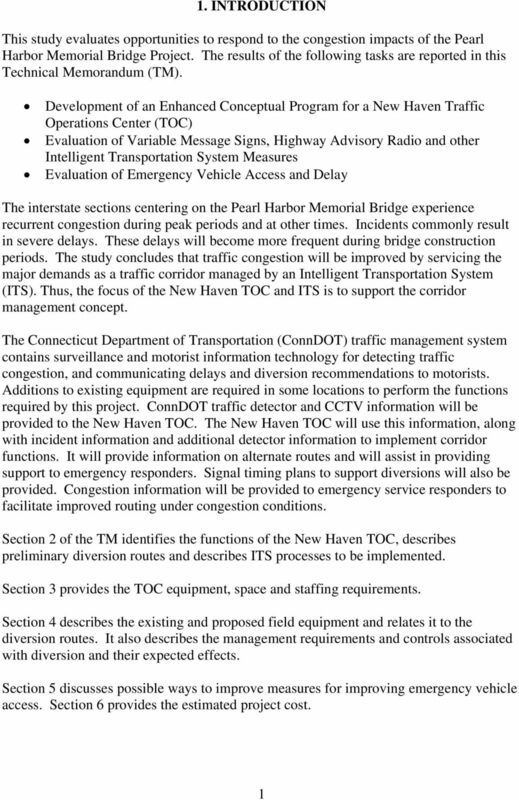 Congestion information developed by the TOC will also be provided in a concise and rapid format to emergency service providers. 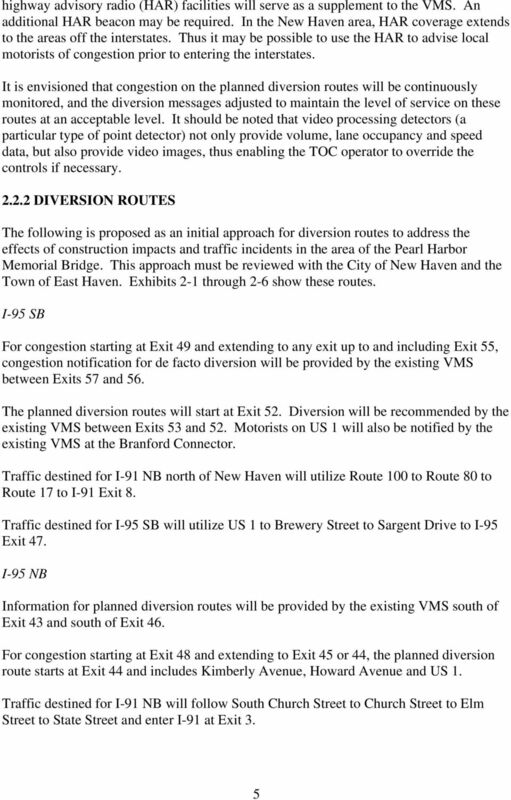 ConnDOT currently operates much of the required equipment, however, additional field equipment will be required. 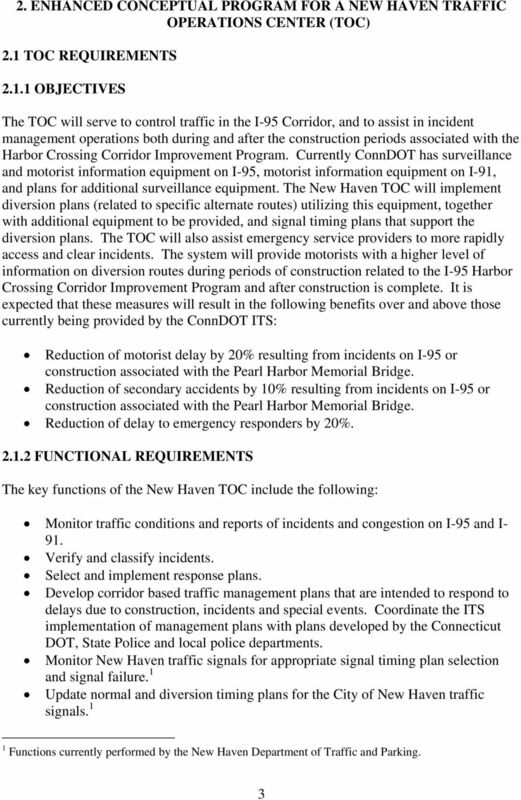 The project requires close cooperation among the major stakeholders including: New Haven Department of Traffic and Parking Connecticut Department of Transportation New Haven Fire Department New Haven Police Department North Central Connecticut EMS Council South Central Regional Council of Governments Town of East Haven Harbor Crossing Corridor Improvement Program With stakeholder participation and approval, a Concept of Operations will be developed to define and coordinate project activities and information flows. 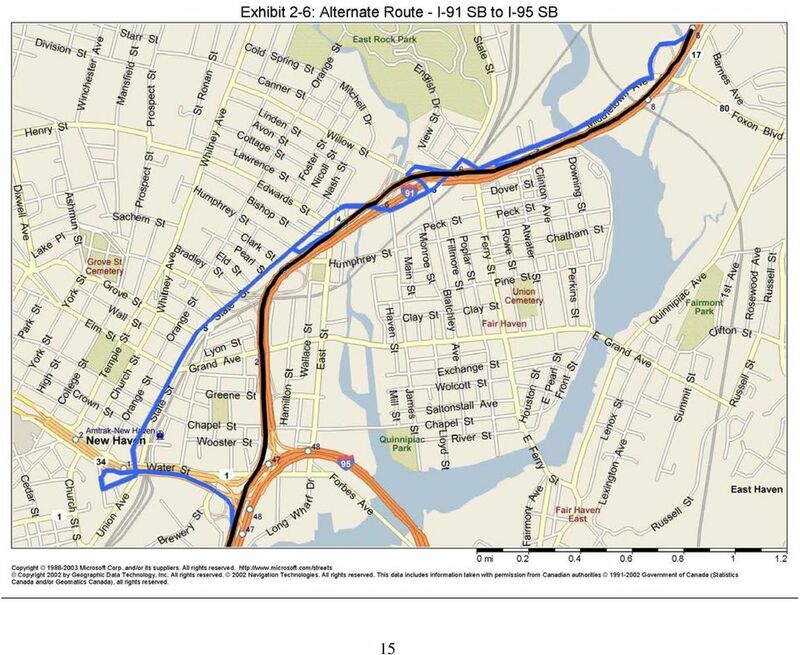 3 Estimated project costs in thousands of dollars are summarized below: New Haven TOC and Field Equipment Connecticut DOT Field Equipment Total Construction $2,400 $640 $3,040 Annual Operations and Maintenance During Bridge Reconstruction $630 $60 $690 Annual Operations and Maintenance After Bridge Reconstruction $490 $60 $550 The concept of using existing ConnDOT capabilities in conjunction with local corridor management represents a significant enhancement to current ITS capability, and may serve as a demonstration for metropolitan areas in Connecticut with similar requirements. 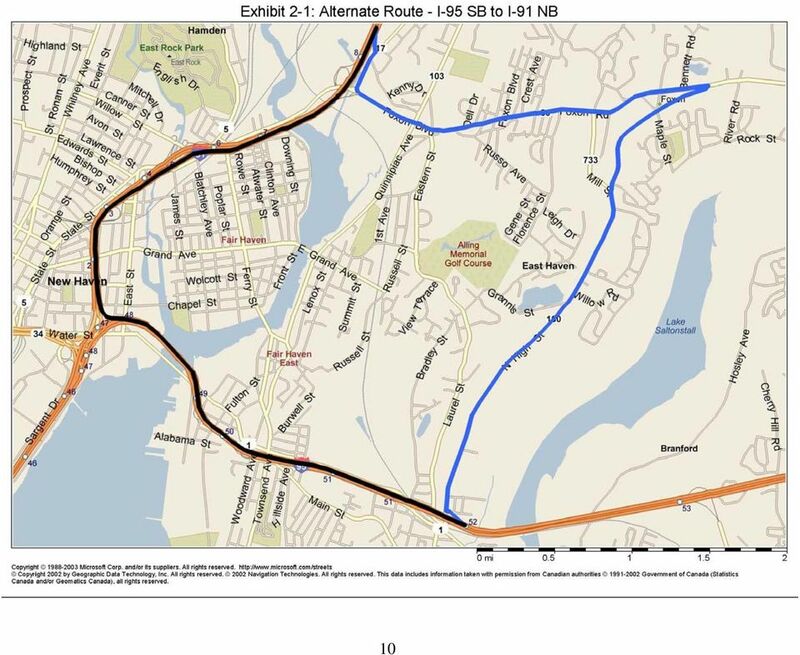 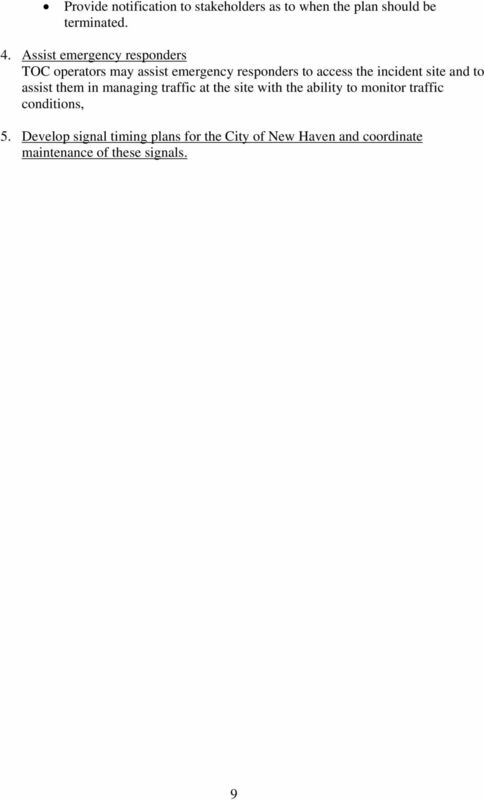 Comment #1: Provide an interchange at Route 7 and Farm Market Road/White Gate Road. 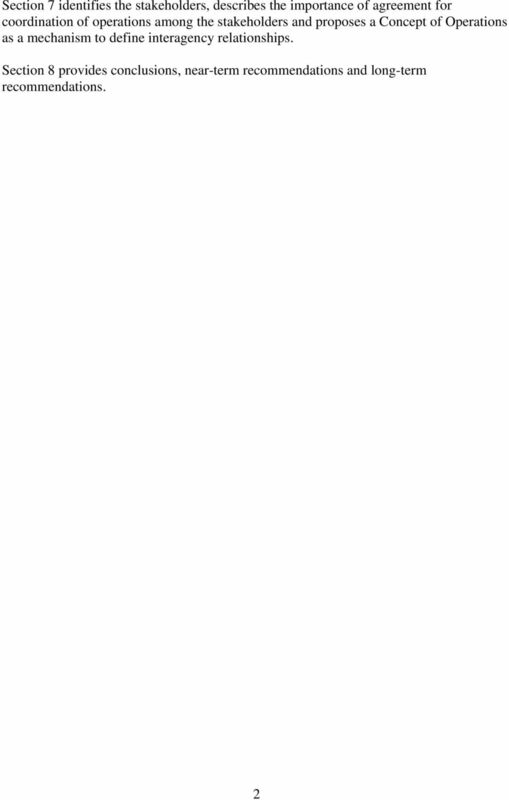 This was studied in the late 1990 s.